Post originally appeared on Progress: A Blog for American History. Re-posted with permission of the author and editor. For some historians, the recurrent debates about the relationship of our “Framers” to slavery and abolition are irritating at best. What those few white men—preeminently Alexander Hamilton and Thomas Jefferson—thought and wrote about the presence of slavery is, of course, important. Their words live on and may still play a part in shaping our political culture. But what interests social and cultural historians is how lives were led, even as sentiments were expressed. What did it mean to live in a regime of gradual emancipation, for example in Hamilton’s New York, at the beginning of the nineteenth century? And why should we care about the contradictions that shaped their lives? For starters, we ought to move beyond our conventional understanding of the relationship of slavery to freedom. Our “neo-abolitionist” commitment to the notion of an antinomic relationship between slavery and freedom, of a binary with an excluded middle, leaves us without resources to understand the in-between legal culture, neither “slave” nor “free,” in which most Americans lived in the years of gradual emancipation. Until the 1860s, the end of slavery was incremental, not an instantaneous event. Gradual emancipation was defined by a peculiar legal culture in which white people and black people often continued to live habitual lives shaped by coerced labor, even as “freedom” became a norm. Slavery remained a lived experience, in the midst of so-called emancipation. At the same time, it also had become common for right thinking white people to express anti-slavery sentiments, to make known their moral qualms. As Alexander Hamilton did, once or twice. The moral complexities of such contradictory circumstances should not be unfamiliar to sentient human beings today. Just as the busboy or the gardener or the careworker in the nursing home, who may or may not be a legal migrant, helps constitute our lived experience in the worlds we live in, so it would be in the “free” or freeish society that was emerging along the Hudson in Hamilton’s life. The routine presence of enslaved or semi-enslaved black persons in any number of service positions offers an equivalent to the cheap labor that many of us rely on today. Formally, what gradual emancipation meant was that the children born to slaves would not be slaves. Nothing more. And formally, in the law, nothing changed for their enslaved parents. What those children were, and indeed, what they would be called, were matters of controversy. In New York, they would live much of their lives in a peculiar in-between status, owing service to masters until they turned 28 if male, 25 if female. As was sometimes noted, this constituted a large portion of an expected life span. New Jersey’s equivalent “term” required service of young men until they turned 25 and of young women until 21. In both states, these children of slaves would in effect “earn” their freedom through their labor. During their years of service, of semi-slavery or semi-freedom, however one called it, they could be sold, though only for their remaining terms. In New Jersey, courts worked intermittently to distinguish the status of the children of slaves from those of apprentices and other (presumably white) bound servants. Meanwhile, the end of slavery for the parents was never marked by legislation. Some New Jersey slaves would never experience freedom, unless they happened to live to a very old age to survive into the 1860s. Still, by then, and indeed, well before, New Jersey would be known as a free state, part of a non-slaveholding North. How did New York and New Jersey’s enslaved peoples become free? How did slaveholders “abandon” their property, which is how the New Jersey legislature labelled the process of emancipation? 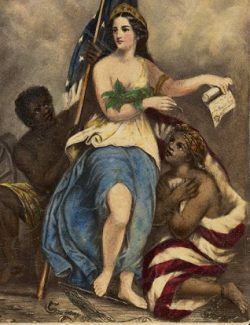 Throughout the era of gradual emancipation, many of those who owned slaves, some of whom were also members of anti-slavery manumission societies, conveyed their human property or freed them or willed them using contractual and term delimited language. The norm, found in wills, in slave sales, as well as on little slips of paper that enslaved people would hold on to tightly, went as follows: Master and slave agreed that, in exchange for five or six or seven more years of service, the slave would then become free. Courts sometimes enforced those agreements. One might say that contractualism, a disruptive force, had “infected” the institution of slavery. One goal expressed in gradual emancipation legislation was to prevent slaveholders from selling off their slaves. New York and New Jersey each passed laws that announced that slaveholders could not move their human property into or out of the state. Such laws were intended to eliminate slave markets. By the beginning of the nineteenth century, moving a slave into or out of the state meant that a New York slaveholder lost his or her property. Passage of such laws surely led to a decline in the prices paid for enslaved peoples: if you can’t move your property, particularly in a mobile society like the early nineteenth-century United States, that property becomes much less valuable, and it will fetch lower prices. Those lower prices encouraged slaveholders to manumit, or more likely, to get out of the increasingly unprofitable business of owning slaves. But those depreciating prices, probably an intended result, also had the paradoxical and unintended effect of encouraging southern slave traders to buy up cheap New York and New Jersey slaves for the southern markets. Moving the slaves was theoretically illegal, but the rewards for doing so were great enough that the law helped produce what abolitionists came to call a kidnapping trade. And an unknown but significant number of slaves (and their “free” children) from those states ended up on sugar plantations in Louisiana, where they would only be freed after the Union Army arrived during the Civil War. Meanwhile, slaveholders could not simply let “their” enslaved peoples go. That, too, was made illegal by statute. New Jersey and New York’s state legislatures worried about the capacity of slaveowners to dump enslaved peoples or soon-to-be formerly enslaved peoples—no longer valuable, no longer property—on the poor relief rolls. They knew that slaveholders—or those who had been slaveholders—did not want to care for aged and dependent black people. But that knowledge translated into a fear that the public would have to foot the bill. The presence of needy formerly enslaved people might put public institutions—county poor relief—at cost, and would surely make for higher taxes. This anxiety resulted in the passage of legislation that declared that only slaves between the ages of twenty-one and forty were eligible for manumission. The laws required that local overseers of the poor, those whom we would call local welfare officials, had to certify that any about-to-be-manumitted black person was capable of sustaining himself or herself, without requiring public assistance. Judges from the county court had to provide a similar certification of the black person’s competence and capacity to labor. Otherwise, manumission was formally forbidden. What were the effects of such legislation? The laws probably did not keep slaves with their “masters.” Nor did they prevent slaveholders from informally “abandoning” aged and dependent enslaved peoples. The numbers of slaves in New York and New Jersey continued to decline, with or without formal manumissions, sometimes with the connivance of “abandoning” masters. In New York City and in Philadelphia, there were vibrant free black communities, into which it was easy to disappear. By the early 1800s, even more after 1815 or so when steamboat travel became frequent, it became relatively easy to escape from a household in which one was enslaved. All it took was passage on a boat. Local overseers of the poor continued to find ways to avoid paying for the care of dependent or aged black people (who may or may not have been ex-slaves). By the 1840s, the number of enslaved people in New York, at least according to the census, was zero; in New Jersey, the number was under 600. 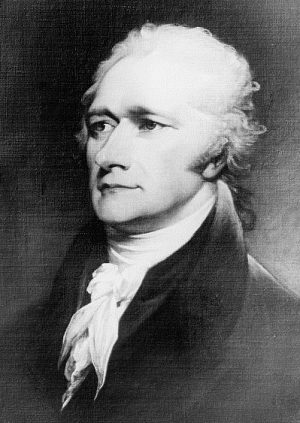 Only then, forty years after Alexander Hamilton’s death at the hands of Aaron Burr, could one claim that freedom had become the norm along the Hudson. Not earlier. The peculiar in-between legal culture of gradual emancipation within which the historical Hamilton lived should remind us of the contradictory and mean-spirited world we live in today. We express a variety of strong political positions about global immigration, as we also watch our tables cleared by global migrants. We are comfortably grateful to those, mostly from distant lands, some of whom are probably not “legal” immigrants, who clean and care for elderly parents. We drive by identifiable spots in many towns, where Central American men wait at six in the morning, to be picked up by garden contractors and other contractors, to do the day labor that keeps our communities pretty. We know that those adult dark skinned men who are bicycling around town do so because they cannot get drivers’ licenses. A driver’s license, an essential mark of adult citizenship—of freedom—in our world is unavailable to them. Much legal energy is devoted to distinguishing the legal status of children of such migrants from their parents. Whether we want open borders or closed borders, however we confront or rationalize our place as profiteers on global migratory flows, we also continue to live our lives. The ambivalences in our lives, the contrasts between moral language and routine experience are constitutive of who we are. We can be, modestly, pro-immigrant or not. We don’t want our tax burdens to increase. Like Alexander Hamilton, some of us might be remembered for having spoken out against the regime we profit from. There is thus much to be learned from exploring Hamilton’s world. Particularly for those of us living comfortable lives in twenty-first century America. Hendrik Hartog is the Class of 1921 Bicentennial Professor in the History of American Law and Liberty at Princeton University. He is also an OAH Distinguished Lecturer.